Getting your dog a puzzle toy is one of the best things that you can do for him or her. Puzzle toys have enormous benefits for your dog, not the least of which is intellectual stimulation that they get playing with it and the satisfaction of solving it. But how do you choose the right puzzle toys for your dog? That’s exactly what we are going to be addressing in this buying guide. 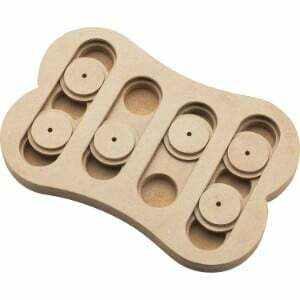 This buying guide will go over all of the different factors that you need to know to buy the right puzzle toys, as well as review some of the top puzzle toys currently on the market. Puzzle toys are appropriate for many different dog breeds including Great Danes, Doberman Pinschers, Boxers, Yorkshire Terriers and Siberian Huskies; and all will benefit from a toy like this. Let’s take a look at five of the best puzzle toys currently on the market. Whether you have Golden Retrievers, French Bulldogs, Beagles, Poodles or Rottweilers, they all need intellectual stimulation. They need to be able to exercise their brain at the same time that they exercise their body. These five dog puzzle toys are perfect for all kinds of dogs, and they represent some of the best of this type of toy currently available. The first is this PetSafe Busy Buddy toy is pretty unique even among all of the other puzzle toys for dogs that are listed here, because it actually allows you to use your dog’s own food and make mealtimes fun. Anyone can put their dog food in a dog bowl or automatic dog feeder, but when you put your dog food inside of one of these interactive dog toys, which they can play with whether they are in their dog playpen, outdoor dog kennel, dog house or even dog crate, then you will have given them a terrific gift that will stimulate them both physically and mentally. This is an egg-shaped ball that you simply fill up with your dog’s food and then put back together and leave it for your dog. You can adjust the difficulty level yourself for your dog. You can make it very easy for your dog to get food out of it, or you can make it very hard for them to get food out of it. However, keep in mind that you can only adjust it when you first start, so don’t make it too difficult or else your dog is not going to get fed. The more your dog plays with the device, nosing around and batting it with their paws, the more food is going to come out of it. Both the small and large versions of this interactive puzzle toys are for dogs that are over 20 pounds, but this is an extremely easy to use device that you can wash in your dishwasher on the top rack and dispenses food easily with a little work from your puppy. When it comes to the best puzzle toys for dogs, this is one of the contenders because it is able to be used in so many different ways. Your dog will love playing with this and getting treats out of it as they learn to work the toy. From Milk-Bone, one of the most recognizable names in dog brands, comes this interactive dog toy that is specifically designed to work with Milk-Bone biscuits. This actually even comes with a few biscuits to get you started. There are two different sizes to choose from, large and small, and they will work for the majority of the dog breeds out there including Golden Retrievers, Beagles, Poodles, Rottweilers and French Bulldogs. The ingenious design keeps the Milk-Bone biscuit inside of the device while still allowing your dog plenty of purchase with their teeth and lots of playability. As they roll the device around and play with it, eventually the Milk-Bone biscuit is going to come out. You can probably use other biscuits with this dog treat dispenser, but it was specifically designed for Milk-Bone treats, so you’ll have the most success with those particular biscuits. The ball is rounded so it is going to roll and give your dog plenty of interactivity, especially when there is no carpet involved, and they will spend just as much time with this toy is they will with other interactive toys like automatic fetch machines. You can attach dog activity monitors to see exactly how long they play with the device while you are gone. Keep in mind that you want to use the small Milk-Bone biscuits with the small ball and medium Milk-Bone biscuits with the medium ball. If you try to use the wrong type of biscuit on the wrong ball it isn’t going to work. It is either not going to come out at all or is going to fall out immediately. However, if use the right biscuit in the right device, you are going to give your dog hours of fun as they try to get biscuits to come out of the dog container, becoming obsessed with making that biscuit shakeout just the same as you would over a videogame. This keeps them busy, calms anxiety and has tons of other benefits. OurPets IQ has a ball that dispenses dog food, allowing for your dog to eat a regular meal while still being somewhat active. The design of this ball is both an advantage and a disadvantage. The dog food comes out pretty easily when your dog plays with the device, which is different than most of the other devices on the market. But this isn’t intended as a challenging puzzle. Instead, it is simply intended as a way to get your dog to exercise while they are eating. This will make their meal more memorable and enjoyable, plus give them a chance to burn off a few calories. It does not take very much work though to get the dog food to come out of the ball. However, the design of this device is relatively simple, and it twists apart for you to be able to insert the dog food easily. You can fill it up with enough food to make a full meal even for medium-large dogs, and if you want to clean the device you can simply put it in your dishwasher. However, it does have some adjustability, so you can raise the difficulty level a little if you want, but the food still comes out easily. Your dog will soon become an expert in using this device to get their food, but you want to keep in mind that this toy is perfect for small to medium dogs but does not contain enough food for the largest of dogs, and it is probably too big to play with for the very smallest of dogs. Giving your dog a treat as a reward for getting food come out of the container is one of the best things that you can do to get them to exercise and inspire creativity and intellectual stimulation. Plus, this toy helps them work different muscle groups as well as keeps their teeth and jaw muscle sharp. This KONG Wobbler toy is a puzzle toy that you will love and it even has some advantages over the other puzzle toys that are listed in these reviews. For one thing, this is a much more challenging puzzle than some of the others that we have been discussing here. This is a bottom-heavy puzzle toy that stands back up whenever your dog is not playing with it, and it is cone-shaped for easy purchase with ridges that your dog’s teeth will be able to grab onto. What is great about this device is that whenever your dog bats it around or throws it across the room with their mouth, it dispenses a treat. You can set the difficulty level, making this a perfect dispenser for both dog treats and dog food. If you want your dog to get lots of activity while you are feeding, then this is definitely the way to go. 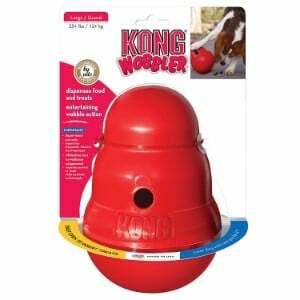 They have to work pretty hard to get their dog food out of the KONG Wobbler, which makes this the best choice when it comes to filling with actual dog treats instead of dog food. The thing that is cool about this device is that it always ends up standing straight up so that your dog can began in the same position every time, and if you take it apart and put it on the top rack of your dishwasher, you can clean it without any hassle at all. Dog puzzle games like this stimulate your dog’s mind and get them to exercise while they are inside the house. This is perfect for dogs that do not get enough exercise from walks or do who do not have an electronic dog door or dog ramp to go outside. Just like getting your dog accessories like cooling vests for dogs in the summer to keep them cool and putting a GPS tracker for dogs on the collar, you want your dog to be well taken care of when it comes to intellectual and physical stimulation as well; and this toy offers that. This puzzle toy is one of the best pure puzzle toys currently on the market, and certainly the best pure puzzle toy reviewed here. If you want a dog puzzle toy that your dog can use while they are on their dog bed or laying on their cooling pads for dogs, then this is definitely the one to get. This puzzle toy doesn’t have to be pushed around or grabbed with their teeth. They can sit out on top of their indestructible dog beds and play with this puzzle toy until they have uncovered a treat. The way it works is by having compartments that are covered with different sliding doors. Each of the compartments is set up in a row, and the doors only cover one or two of the three compartments at a time. That means that you can put treats into the device, close the doors over the areas that you put the treats in, and then watch your dog go to work trying to push the doors aside with his paws or nose to get at the treats that are in there. Of course, the first time that you use this toy with your dog you are going to have to teach them that there is a treat inside. But after that, they should be able to learn that if they slide the doors apart they are going to get something good to eat. The only thing you want to keep in mind with this particular puzzle toy is that you have to take it away when they are done because otherwise they will stop playing with it if they suspect that there are not going to be treats as a reward for sliding the doors apart. There are a few things that you want to keep in mind when it comes to buying a puzzle toys for your dog. In fact, there are a few different factors that are extremely important that you should know before you ever go shopping for your first puzzle toys for dogs. We have come up with some of the things that you want to remember when it comes to getting a puzzle toy for your dog, including factoring in things like the size of your dog and the level of difficulty that you want to give them. There are lots of different puzzle toys on the market, and if you decide that you do not want to go with one of the ones reviewed above, then you are going to want to know how to shop for a puzzle toy. With so many different things to consider, it can take a bit of research and be rather challenging to come up with the perfect toy. That is especially true considering that there are various types of puzzle dog toys on the market. What type of toy that you want, and what you want the toy to do specifically, will help you determine what kind of toy to buy. 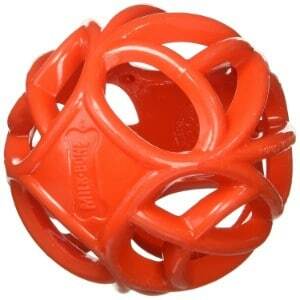 There are lots of benefits that come from getting a puzzle toy for your dog. Let’s look at some of the benefits, one at a time. First of all, puzzle toys for dogs offer intellectual stimulation. That means that your dog is able to exercise his brain, something that only happens when you play with him directly or when there are other animals involved. However, even if you have another dog or a cat that your dog regularly plays with, there is still a lot to be said for puzzle toys. Your dog gets a great deal of satisfaction and stimulation from playing with them. In addition, most of the puzzle toys on the market also require that your dog exercises. 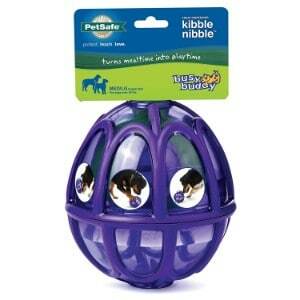 This gives your dog a workout at the same time that they are stimulating their brain. Your dog will likely have to paw at, nose or attempt to grab with their teeth, whatever puzzle toy you get for them. They will play with it in the very same way that they play with you, particularly if you get a toy that draws them in and makes them want to respond. These types of toys are very good at getting your dog to continue to exercise, especially if it rewards them with food or treats. But puzzle toys for dogs are also helpful when it comes to helping your dog exercise his jaw muscles and promotes good dental health by giving them something to chew on. Puzzle toys for dogs are simply terrific things that have, promoting physical activity, mental stimulation and a whole lot more. Plus, they keep your dog from getting bored, having anxiety and tearing up things around your house. If your dog gets bored or tends to get antsy when you are away, then a puzzle toy might be the perfect solution. The type of puzzle toy that you get is also a consideration. There are lots of different puzzle toys out there, but they usually come in one of four basic types. Let’s look at each of these types individually so that you can see which one is best for your dog and make a decision on what type of dog puzzle toys you’re going to be shopping for. Noisemaking Toy: Do you want a noisemaking toy that is going to keep your dog engage with sound? The advantage of this is that it draws your dog in and gets them to play with it even when they are starting to get bored with it. Some of these make humanlike sounds or even have speech programmed into them, and they can add a great deal of playability and interactivity to the toy. However, the disadvantage of sound-based puzzle toys is that they are going to be distracting in even annoying if your dog is playing with his toy while you are trying to watch television, work on the computer or even sleep. Light-up Toy: What about lights? Do you want your pet toy to light up and engage your dog that way? Light up toys can be engaging, although they are not as effective as sound based puzzle toys. Having a toy that lights up in the tracks your dog’s attention can be useful, and the rewards that they get from playing with it are also usually a series of light patterns. 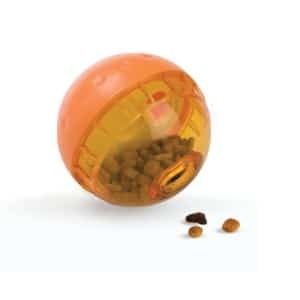 Treat-Dispensing Toy: One of the most common types of puzzle toys out there is one that dispenses a treat or dog food. This is probably the most effective type of puzzle toys out there, and your dog will keep playing with it until it is completely empty. This is a great way to dispense food, because it promotes exercise and get your dog to burn a few calories during their meal. It is also a great way to keep their attention, stimulate the mentally and prevents separation anxiety. Self-Moving Toy: Toys that move by themselves can be effective as well. You have probably seen these toys in a limited fashion with your dog or even with your cat. Wind up mice that move across the room are popular cat toys, but balls that propel themselves forward to get your dog to play with them are also popular. There are three main types of materials that puzzle toys are made from. Each of these materials has their own advantages and disadvantages. Let’s take a look at each one as well as the type of toys that are typically made from that particular material. Understanding the construction materials will help you make a better decision when it comes to buying your next puzzle toys. Plastic: Many of the toys on the market are made from plastic. In fact, the majority of the toys out there are made from plastic. Whether your toy dispenses a treat or has electronics inside of it that make sounds or lights go off, typically the construction material of choice is plastic. Plastic is rugged, durable and very easy to clean. Many of these plastic toys you can simply put in the top rack of your dishwasher and wash. Plush: Plush toys are also popular in the puzzle toys market. Plush toys are like stuffed animals. The disadvantage of going with a plush toy is that they are not indestructible and will not stand up to heavy use by your dog nearly as well as plastic will. However, they are soft and fun to play with. Plush toys are inexpensive and dogs love playing with them. Rubber: Rubber interactive toys, such as the ones that are designed with a tennis ball format, are also available, although most of the toys out there are made from other materials. Rubber has some advantages over the other materials listed here. For one thing, rubber can bounce. That means that if your dog plays with it on a non-carpeted surface, it will bounce around and give them more exercise. Rubber also stands up really well to chewing. Rubber toys often outlast other types of toys because of their increased durability. How important is size when you are shopping for a puzzle toys for your dog? The answer is both important and perhaps not so important. Size is only important if it affects the way that your dog interacts with the device or plays with it. For example, you can have a one-size-fits-all puzzle toys for dogs as long as dogs are able to grip onto the device of their teeth or bat at it with their paws – whatever the device was meant to do – no matter what size their mouth is. Some puzzle toys for dogs come in various sizes, because the larger toys will be difficult for smaller dogs to interact with, and the very small toys are not going to be appealing to larger dogs. Size is definitely a factor if the size is going to determine how effectively your dog is able to play with the device. For example, if the device dispenses treats, and you have an extremely large dog, then you definitely want to keep size in mind because a very small toy that only dispenses a few treats is not going to be of as much interest to your dog as a larger toy that gives them a larger reward. The difficulty level of puzzle toys for dogs is also something you want to consider. Difficulty level determines how easy or tough it is for your dog to get the reward. You definitely want to make sure that your dog is getting a reward from the puzzle toy or else he or she will stop playing with it; that is, after all, the point of the device in the first place. Intermediate: Medium-difficulty toys are a little more complex than easier toys. Intermediate toys usually have a two-step process that is required to get the treat or trigger the reward. These are good for dogs that have some experience with puzzles and need a little more intellectual stimulation because they get bored with easy toys. Advanced: If you want a toy that is complex and really challenges your dog than you want an advanced puzzle toys for dogs. Advanced toys require several steps in order to get the treat. They are for dogs that are especially curious or who get bored easily by puzzle toys. These will often require three steps or more in order to trigger the reward. Adjustable Difficulty Level: There are also toys that have adjustable difficulty levels too. These toys will allow you to set whatever difficulty level you want, sometimes only once when you first set up the toy, but other times at any point. This allows you to start off easy when you’re introducing your dog to the device and then make it more challenging as they start to get bored with how easy it is. If you can, getting a dog puzzle toy with an adjustable difficulty level is definitely recommended. Here are some important factors when it comes to puzzle toys that you definitely want to keep in mind. These are things that are true no matter which type of puzzle toy you are looking at. Keeping these factors in mind will help you choose the right one and ensure that your dog is going to be as happy with the puzzle toy as you are. Engagement: Whether your toy actually engages your dog is important. You have to determine if the toy actually works for most dogs. This is done by reading the reviews and examining the toy in action. Often, you can find videos that show dogs playing with the toy. If it looks like it would be boring for dogs, and the dogs and the video are not responding with the excitement that they would respond to someone playing with them, then you probably want to skip that particular toy. Durability: How durable the toy is is also pretty important. Although most of the puzzle toys on the market are extraordinarily inexpensive, you still don’t want to be replacing them every week. Getting a puzzle toys for dogs that is going to last through several weeks or months is definitely preferred. But it all depends upon how much your dog plays with the toy and how hard they are on it. The type of toy that you choose and the material that is made out of are all factors that you will want to consider carefully because they affect how durable the toy will be and how long it will last. Safety: Safety is always a consideration when it comes to buying accessories for your dog. You want your toy to be safe for them. That means that it should not be a choking hazard, it shouldn’t have any electronics that would shock them or any sharp points or sections that could cut them. Most of the toys out there perfectly safe and it is very rare that you come across a toy that could actually be dangerous. However, it is something you want to keep in mind. Personal Appeal: Does the toy appeal to your dog personally? That’s something that only you can decide, and it is based upon various factors like the breed of your dog, their natural curiosity, their personality and intelligence level. Some dogs really enjoy certain types of puzzle toys while others will play with just about anything. Every dog is different, so you will have to figure out for yourself whether a particular toy is going to be effective for your dog or not. There are a few other considerations to keep in mind as well. The first is that you want to toy that encourages socialization. You don’t want your dog to be playing with the toy all the time. You want them to still be open to playing with humans, and even sharing the toy with humans and playing together. You also want to toy that encourages physical activity. If the toy doesn’t offer exercise as part of its design, then you may want to think about a different toy. There are lots of toys out there that will cause your dog to exercise while they are playing with it, and that is one of the major benefits of these types of toys. Of course, the main focus of a puzzle toys for dogs should be the mental stimulation that it provides. Mental stimulation has a number of benefits for your dog. First of all, it can help to treat separation anxiety and prevents your dog from acting out such as chewing up all kinds of stuff around the house and destroying things. Dogs that have separation anxiety get panicked in need some kind of mental stimulation when their owners are not present. A puzzle toy can definitely help with this. In addition, puzzle toys for dogs may also promote dental health by giving the dog something to chew on. These are all things that you want to consider when you are looking at the different types of puzzle toys that are out there in deciding which one you want to get. The bottom line is that there are lots of different factors to consider when it comes to choosing the right puzzle toys for your dog. From the material that the toys constructed from to the type of reward that it offers, puzzle toys for dogs come in every size and shape. The type of toy that you get will depend upon what your dog likes and what is going to challenge them both physically and mentally. Hopefully, this buying guide has been able to give you a great deal of information about how to choose the right puzzle toy, and even giving you some good recommendations on puzzle toys to get for your dog with the reviews that were posted at the beginning of this buying guide.